Event Description: Attractively situated in the lakefront museum campus, this classic structure is minutes from downtown but seemingly worlds away from the city’s the hustle and bustle. 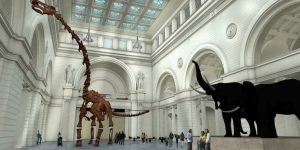 Location History: Founded in 1893 to house the biological and anthropological collections assembled for the World’s Columbian Exposition, the Field Museum is one of the finest natural history museums on the planet. During your corporate team building treasure hunt…you’ll gawk at Sue the Tyrannosaurus Rex (one of the best preserved in the world), explore ancient Egyptian tombs, and come face to face with lions and zebras and bushmen. Treasure hunting at the Field Museum is like sleuthing your way around the world and back in time. Admission not included in program fee.